Average employment and the number of unique workers employed in California agriculture (NAICS 11) has been rising, to 425,400 and 989,500 in 2016. 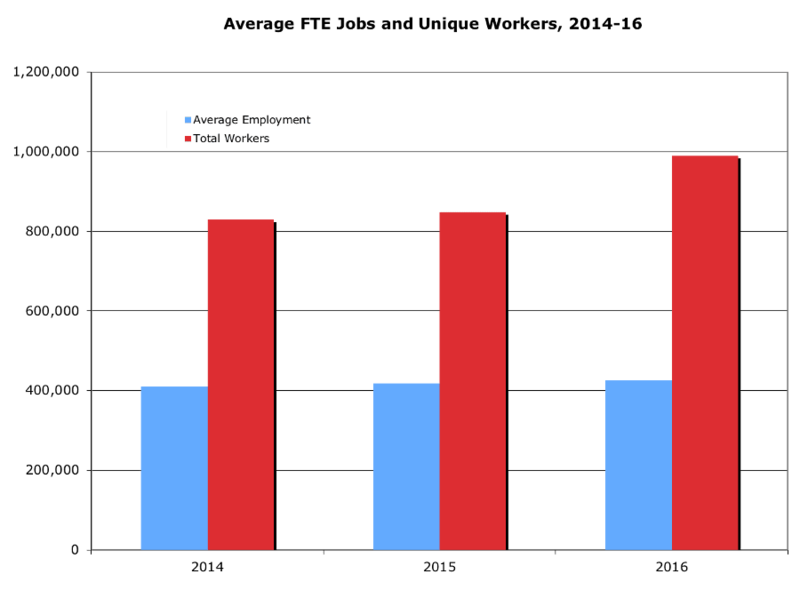 Average employment represents 12 monthly snapshots of persons on the payroll during the period that includes the 12th of the month, and is a measure of full-time equivalent (FTE) jobs. Unique workers are all persons reported by employers when paying unemployment insurance taxes, including those not on the payroll during the 12th of the month. Average employment has been climbing slowly, but the number of unique workers rose by 142,000 between 2015 and 2016, suggesting that more workers are trying farm work.